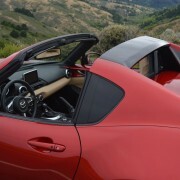 The new Mazda RF’s folding hardtop does Zero-to-Closed in just 13 seconds. 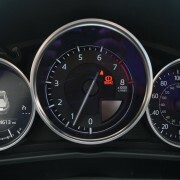 The MX-5 itself takes somewhat less time than that to complete the Zero-to-60 MPH run in just 7 seconds. 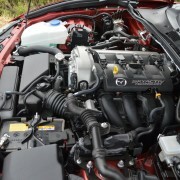 No matter what performance parameter you examine with this Mazda, the operative word is quick. 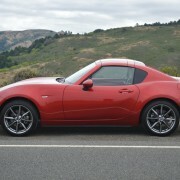 It transitions through corners with a quickness that would make any Porsche envious. And it does so at a stellar bargain base price of $32,620. That’s less than the options alone cost on many new Porsches. 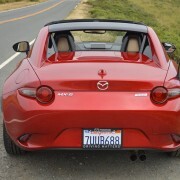 The RF designation refers to the fact that this new model offers more than just a disappearing hardtop. RF stands for “Retractable Fastback” and the look of the car with the top up will leave no doubt about the “Fastback” part of the name. 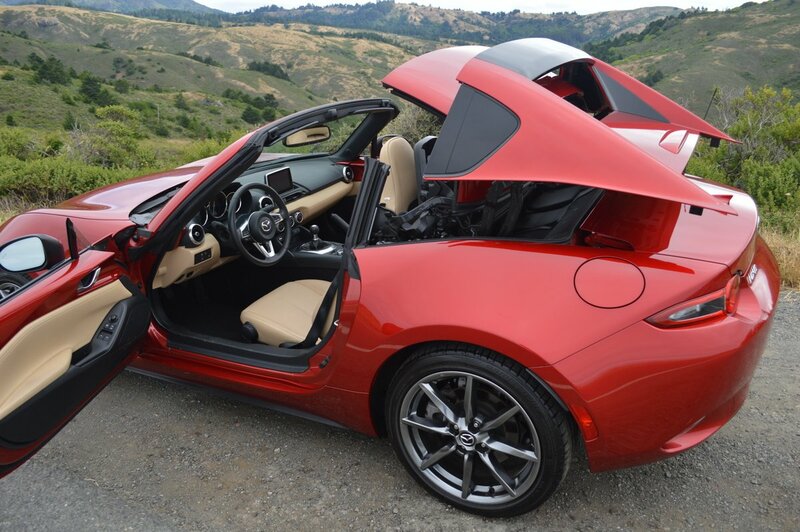 From the side windows forward, the RF looks virtually identical to the standard convertible version of the MX-5. 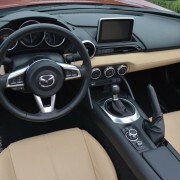 However, on the RF, Mazda designers have appended a pair of flying buttresses to the sides of the cockpit which fare gracefully into the tops of the rear fenders. 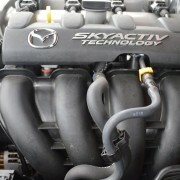 This substantial modification lends an unexpectedly exciting visual twist to the Miata’s well known profile. In RF form, designers have exchanged cuteness for sleekness. 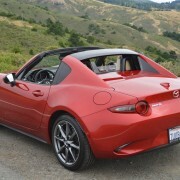 From both side profile and rear view the RF looks substantially better than any previous Miata. 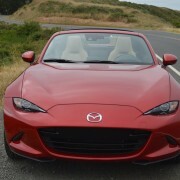 In fact, first time viewers often fail to realize they are even looking at a revision of the world’s most popular roadster. I know that was my reaction when I saw an RF for the first time. 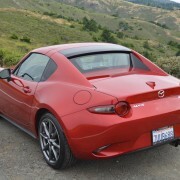 To me, it recalls the caliber of design you once saw from Italian masters like Pininfarina, Bertone and Zagato. 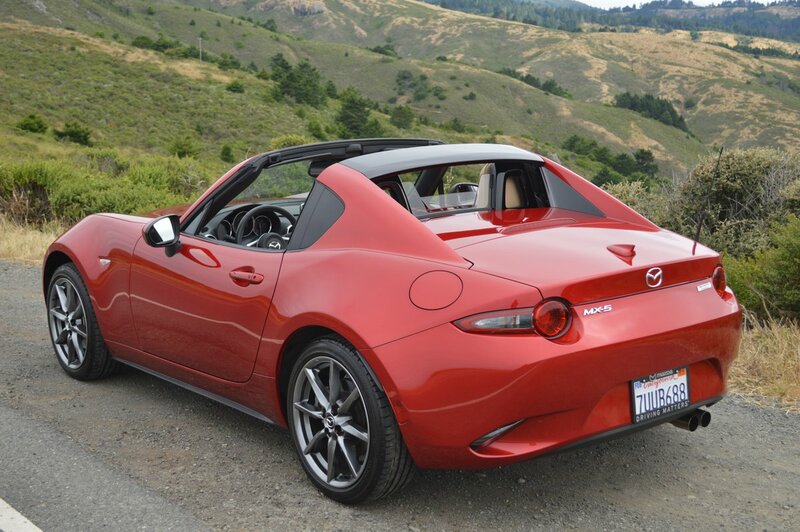 This Mazda looks so good it will transport you back to the classical Italian design period of the 1960s. 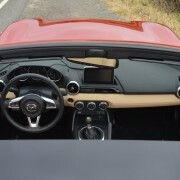 The folding top not only improves the looks of the MX-5, it also adds a note of improved civility to your time in this car’s confined cockpit. 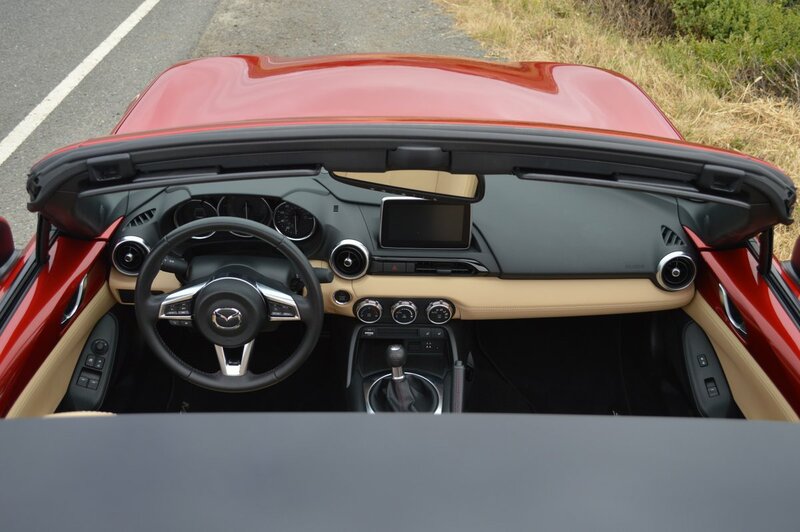 With the top erect, the level of noise inside the cabin is less than you would experience in a top-up roadster. 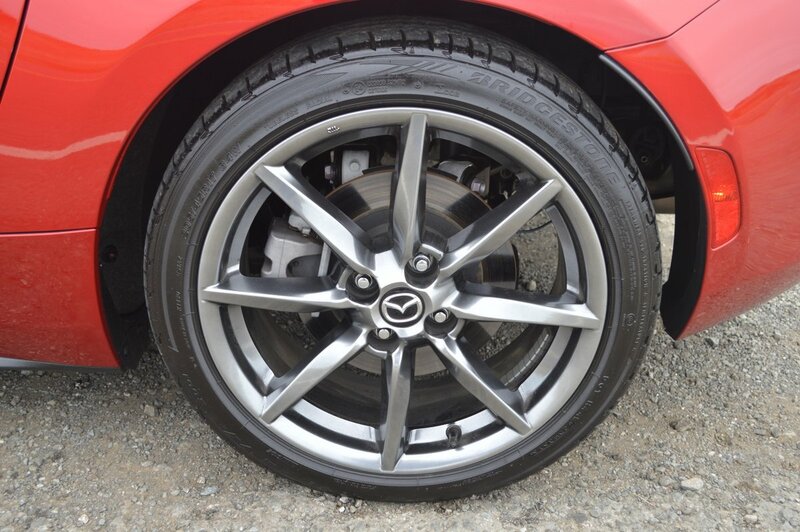 The RF allows you to enjoy all of the MX-5′s precision reflexes, pin point handling, and driving joy while affording you better protection from the elements. Even with the top down, those fastback wings and rear window remain in place, affording you an extra measure of wind-free quiet. But there is a one substantial price to pay for those protective buttresses. They inhibit side and rear sight lines. 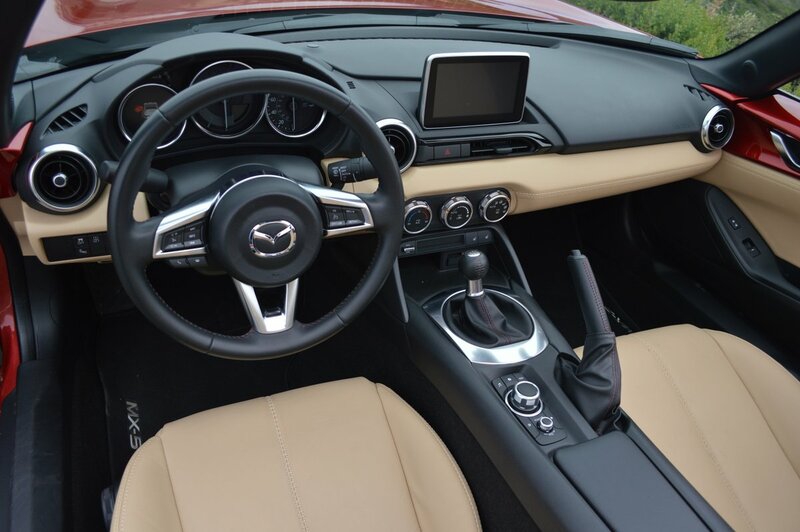 No longer do you enjoy the unmitigated 360 degree field of vision provided by the top-down MX-5 convertible. In fact, that immoveable structure next to your head prevents you from seeing what’s right next to you when you want to make a simple lane change. 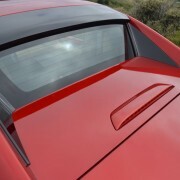 In terms of added security, the erect hardtop is infinitely preferable to the protection of a cloth roof. No one is going to break into the RF without a power tool. In terms of handling dynamics, the added weight of the roof and its motor raising apparatus have had no appreciable effect. 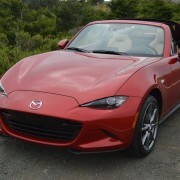 RF exhibits exactly the same breed of lightning reflexes that have long made the convertible Miata the benchmark sports car for handling. 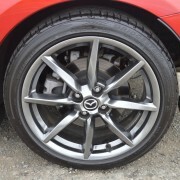 Our test RF’s 17 inch smoked pewter alloys came with top drawer Bridgestone S001 radials (205/45R17) that never so much as chirped during hard cornering. 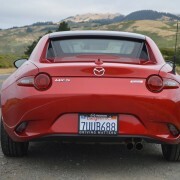 This Mazda is without question one of the best handling cars available from any manufacturer today. 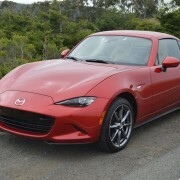 Mazda like to use a Japanese phrase in reference to the MX-5 that translates into English as “The rider and the horse are one.” The fact that our test sample was finished in Soul Red Metallic paint added to this mystique, since Mazda has chosen that same shade for its #55 IMSA Prototype racer which recently scored a podium finish at the 6 Hours of Watkins Glen. 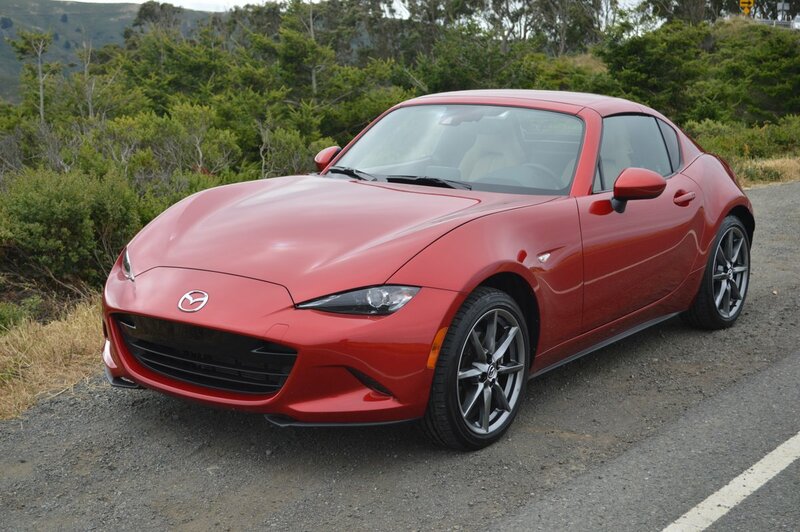 For those of you who have grown tired of the Miata’s long standing proportions and appearance, the RF offers a fresh take on this sports car icon. 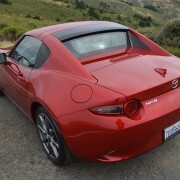 I acquainted myself with the exceptional subtleties of the new design by slowly washing my test MX-5. 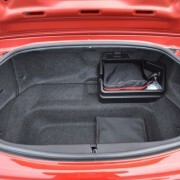 It provided a great opportunity to appreciate the subtle beauty of the car’s carefully integrated design. 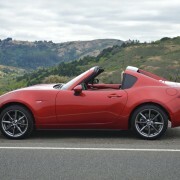 Mazda calls this design dynamic “Kodo” or the “Soul of Motion.” That explains why you will never see an unnecessary scoop, louver or crease appended to any Mazda. Consequently, the appearance of their vehicles always matches the purity of their design creed.